We deal with optimal two-material antireflection (AR) coatings for the visible and adjacent spectral regions. 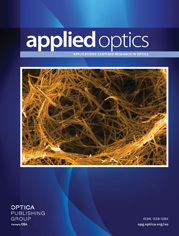 It has been shown before that, for a given set of input parameters (refractive indices of the substrate, ambient medium and high- and low-index coating materials, and for a given spectral width of the AR coating), such designs consist of one or more clusters of layers of approximately constant optical thickness and number of layers. We show that, through the analysis of many different optimal coatings, it is possible to derive two parameters for a simple empirical expression that relates the residual average reflectance in the AR region to the number of clusters. These parameters are given for all possible combinations of relative spectral bandwidth equal to 2, 3, and 4; low-index to ambient-medium index ratio equal to 1.38 and 1.45; and high-to-low index ratio equal to 1.4, 1.5, and 1.7. The agreement between the numerically and the empirically calculated values of residual average reflectance is excellent. From the information presented the optical thin-film designer can quickly calculate the required number of layers and the overall optical thickness of an AR coating having the desired achievable residual average reflectance.